Newly Released Photos Tell Story of Internment After the bombing of Pearl Harbor, the U.S. government imprisoned more than 100,000 Japanese Americans. Dorothea Lange was hired to document the internment process, and the photos have only now been published. Watch a slideshow of Lange's images. 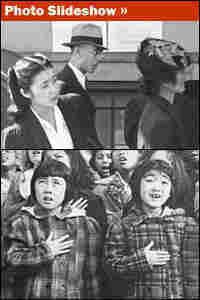 Soon after the Japanese bombed Pearl Harbor, President Franklin Roosevelt authorized the imprisonment of more than 100,000 Japanese Americans. They were forcefully moved from their homes to makeshift concentration camps, like Manzanar near Death Valley. To document this process, the government hired photographer Dorothea Lange, but then impounded her photos. Many of them have never been seen or published until now. A new book features more than 100 of these stark black-and-white images, and sheds new light on this chapter of American history. Editors Linda Gordon and Gary Okihiro discuss their new book, Impounded: Dorothea Lange and the Censored Images of Japanese American Internment.